The jobs report came in far under expectations and the markets sold-off hard at the open. 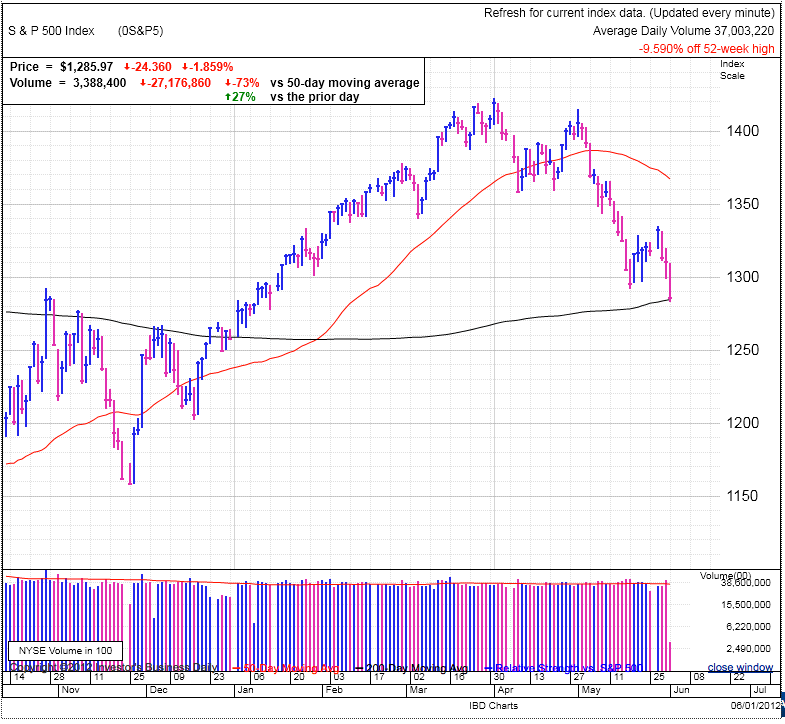 Both the S&P500 and NASDAQ made new lows in early trade, putting an end to the rally attempt dating back to May 21st. This means we are at least four days from a legitimate buy-point. But given the headlines, I don’t expect market participants are ready to start buying equities with reckless abandon any time soon, so patience is the key. The more interesting debate is if the market is shortable on this news. Are we on the verge of a cascade sell-off, or has a lot of the selling already occurred and we are in the process of forming a base before heading higher? The two things to consider are 1) has European turmoil and the feeble US economy actually caught anyone off guard and 2) is the market extended or compressed? The answer to those two questions will give us strong clues about the potential for a cascade sell-off. Maybe I’m off base, but it seems like the news has reported Euro troubles and a pathetic domestic recovery for at least a couple of years, so I doubt the recent headlines are catching anyone off guard. The second aspect is we have long since sold-off from our March peak. Looking back to last July’s crash, we were coming from 52-week highs prior to the plunge. The sell-off over the last two months has taken a lot of potential energy out of the market. Many of the weak holders have already sold, leaving far less fuel for a sell-off this time around. Of course the thing about a panic sell-off is it can turn resilient bulls into weak-kneed worrywarts over a matter of days as the market crashes through support levels and triggers additional stop-loss selling. But so far I am encouraged by the floor the indexes are finding at the 200dma, indicating traders are not rushing for the exits…….yet. But as we flirt with the 200dma, it wouldn’t surprise me to see the market dip under, triggering all the stop-losses sitting at this level. The question is how much lower do we go if we break through. Do we just poke our head under? Do we drop to 1257 to go flat for the year? Or do we fall all the way to 1200? I find 1200 the least probable outcome without a new catalyst pressuring the markets. A slowly growing US economy and European infighting is already priced in the markets. But actual US job losses and economic contraction could spook traders. Same goes with a fatal breakdown of European negotiations. But for the trader, both of these would most likely trigger temporary dips as it flushes out all the pessimists and weak holders. The lower we go, the bigger the bounce will be. As for Greece, booting them out of the Euro might initially trigger a sell-off, but it could bounce shortly after as the initial panic transitions to relief that the Euro is actually stronger without Greece. As for individual stocks, the best performing stocks as of late are getting smacked down. LQDT, SWI, CRUS, and TRIP are all selling off hard after making recent 52wk highs. During a market correction, resist the temptation to buy stocks showing great strength because they are far more vulnerable to broad market weakness. 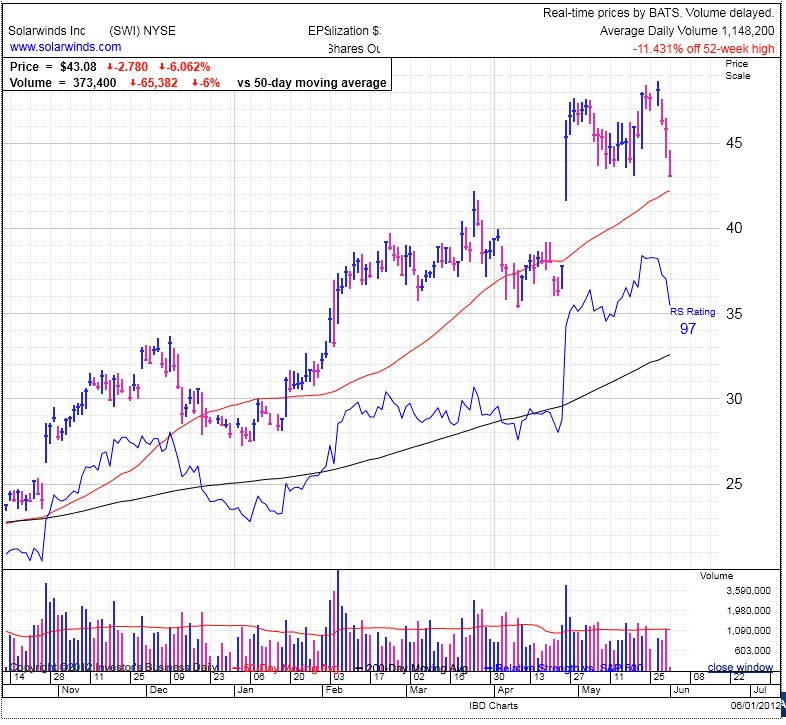 All of these stocks have shown unusual strength recently, but in a market correction that simply makes them good watch-list candidates, not buy candidates.